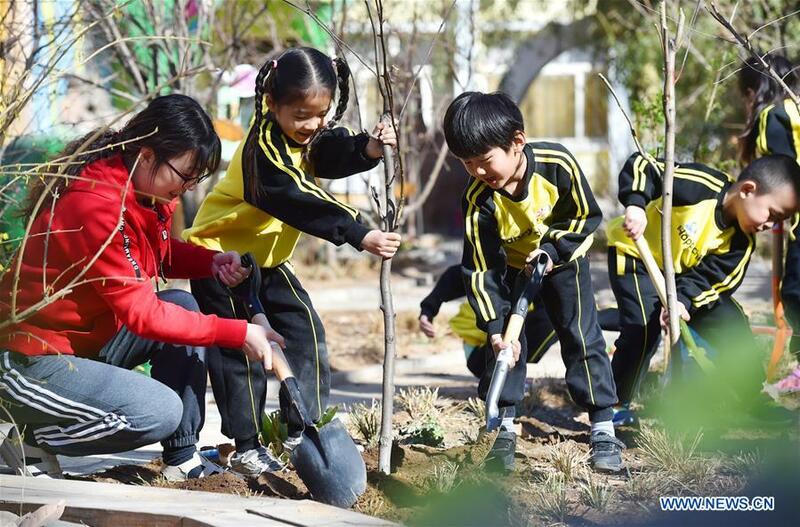 China has witnessed remarkable growth of tree coverage with the implementation of afforestation projects, a senior forestry official said on Tuesday, National Tree Planting Day. The forest coverage rate in China has increased by nearly 10 percentage points in the past four decades, with the world's largest planted forests and an 80 percent expansion of forest areas, said Zhang Jianlong, head of the National Forestry and Grassland Administration. According to a report released by the National Afforestation Committee on Tuesday, 7.1 million hectares of trees were planted and 6.7 million hectares of degraded grassland were treated last year. Per capita greenery coverage in urban areas was 14.1 square meters in 2018, up by 0.6 square meters year-on-year. As part of the plan to build a "Beautiful China", the country has vowed to increase its forest coverage to 26 percent by 2035. To fulfill the target, Zhang said China should maintain the pace of afforestation - about 6.7 million hectares of trees newly planted each year - while implementing strict protection of forestry resources. However, he said that the low survival rate of trees remains a challenge for afforestation, and the administration is determined to tackle this problem in the coming years. "To maintain a high survival rate, most of the effort should go toward keeping plants in a healthy state rather than simply planting trees," he said. "Also, species should be planted with the right techniques in inhospitable places." The administration will also promote the ecological restoration of grasslands and push forward the establishment of pilot national parks. China is rich in grassland resources - with nearly 400 million hectares of natural grassland accounting for 41.7 percent of the country's land. Protection and restoration of grassland resources will be strengthened, Zhang said. Measures to be taken include finding out the entire picture of grassland resources, assessing current policies, and drafting a guideline on how to strengthen grassland protection and restoration, he said. As for national parks, Zhang said that after the central authorities released an overall plan for introducing a national park mechanism, the administration drafted a layout of national parks and standards for their protection. Illegal projects have been gradually eliminated to protect natural reserves. So far, more than 100 illegal mining projects have been withdrawn from Mount Qilian National Park, one of the country's 10 pilot national parks, Zhang said. Under a plan released in 2017, China aims to set up a batch of national parks covering about 200,000 square kilometers, and to form a unified management system by 2020. China's achievement in afforestation was recognized in a study by the United States' space agency NASA published last month. It said China and India are leading the increase in greenery globally - with China alone accounting for a quarter of the global net increase in leafy area despite having only 6.6 percent of the world's vegetated area.